Home » 2013 » November » 01 » Unique Art Supplies You Probably Don’t Own but Should! Unique Art Supplies You Probably Don’t Own but Should! From beginners and hobbyists to even the most advanced artists, many people who paint, draw or experiment with other mediums often tend to stick to the same set of art supplies while making a work of art. Whether it is due to pricing, comfort with the tools or a lack of knowledge about other supplies, you may be limiting yourself by not branching out and trying different tools. 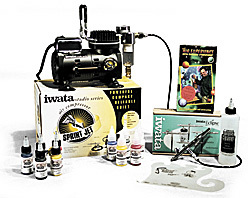 The first tool that is great for painters, drawers, and mixed media artists alike is an airbrush machine. This paint spray tool can be used to create traditional pieces, to accent works of art or it can be used for fine detailing. The technique of airbrushing takes practice- but the results that can be created once you have mastered your new tool are well worth the time it takes to get used to the machine. The second item that is an essential for all painters who are going for that shiny, glossy look. Purified linseed oil, a colorless to yellowish oil obtained from the dried, ripened seeds of the flax seed. Linseed oil can be applied over finished paintings to create a beautiful shine. Also try using it with oil paints by mixing the paint with the linseed oil to give each piece a distinct, transparent effect. The third item is a light box. Most useful for drawers, illustrators and sketch artists, a light box is a great way to make high detailed pieces easier to complete. Highly versatile and fun to experiment with, light boxes can be used for a wide array of purposes, including scrap booking, stenciling, jewelry making. By providing direct light on the surface of the medium, you can plainly see the intricate details you are working on, helping you complete the most complex pieces of art. The last item you need to add to your art supplies list is gesso. Gesso is a versatile tool the resembles white paint. It is made from a binder mixed with either chalk, gypsum, or pigment. It comes in a variety of types and serves a variety of purposes. Gesso can be used to prep canvases, it can be used in sculpture work, it can be used to adhere surfaces to each other and it can also be used as a thickening agent. Gesso is a diverse art supply with almost unlimited uses.